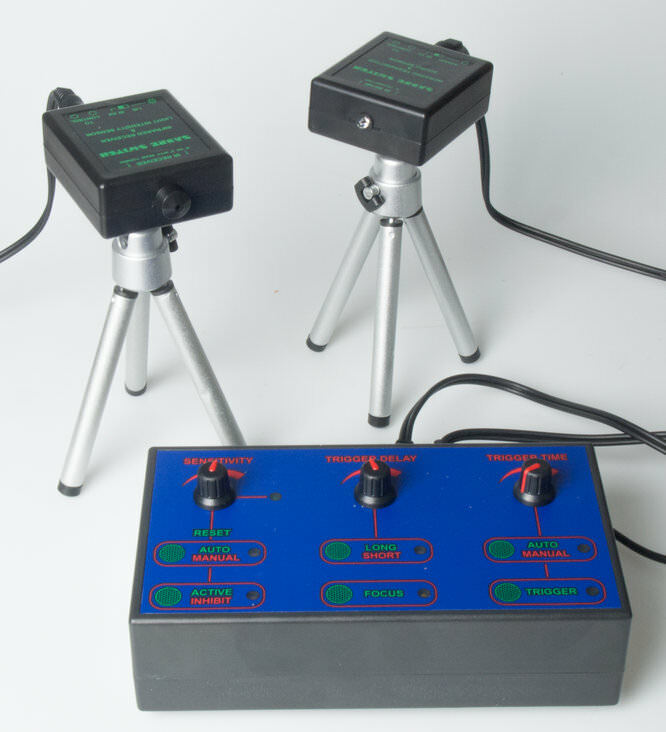 The Sabre Switch Triggersmart motion capture system is designed for wildlife and high speed photography and can trigger a camera when sound, light or motion is detected. Once the work of professionals and scientists, high speed photography has been brought into the realms of enthusiast with gadgets like this Triggersmart from Sabre Switch. For £240 this electronic device fires your shutter automatically when its sensors detect sound, motion or light changes. It means you can photograph super fast subjects or timid wildlife. Peter Bargh takes the Triggersmart on a trip into the high speed world of motion capture photography. 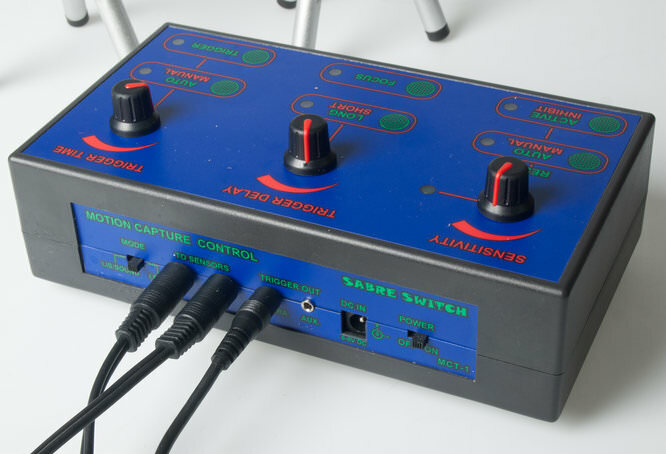 The Triggersmart MCT-1 is a small 19x15x5cm control unit with touch pad buttons and three control dials. It has a blue fascia with green and red labelling. It looks like something you'd build out of a Practical Electronics magazine. 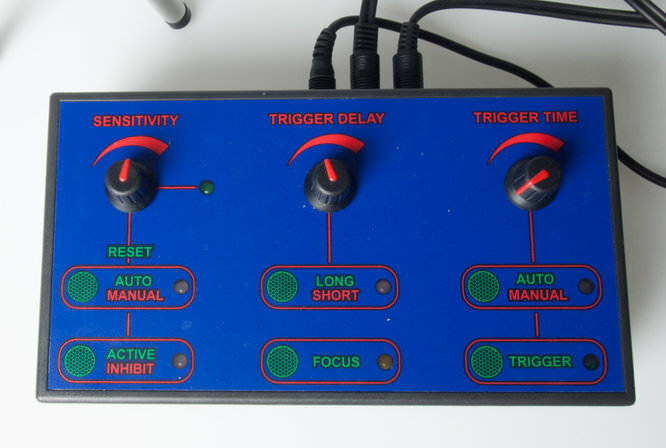 The controls let you adjust trigger sensitivity, delay and time. Around the back are sockets for the cables used to connect to the two supplied sensors along with a DC in for the supplied power supply and two trigger out sockets for the camera remote cable. There's also a power switch on the back and a sound or beam splitter switch. The control unit comes bundles with an infra-red sensor and receiver, two mini tripods to support the sensors, two sensor cables and a 3m camera trigger cable with a 2.5mm jack. Once you have the cables plugged in and the sensors in the right place all you need to do is adjust the controls to suit the subject you're about to photograph. The sensitivity knob is first rotated to the right until the LED glows and then finely adjusted back so it extinguishes. This fine tuning ensures the sensor is at its most sensitive for the subject's sound or light activation. The transmitter / sound sensor has a microphone that can detect any sharp sound such as breaking glass, hand clap or balloon burst, while the light detection will trigger when lightening or flash fires. When recording motion you can use the transmitter and sensor to create a beam that will trigger the camera when split. The beam is about 6 degree angle but can be narrowed using a small 2 degree baffle. This plugs into the receiver and could easily be lost. A slide over cover would be better. The mini tripods are very light, as are the sensor units. The cable is the heavier item so tends to pull the sensor out of position quite easily. Careful arrangement is needed to avoid any disturbance. The touch buttons for the various functions click positively so it's easy to turn the modes on and off, but the contrast of colour labels may be hard to see in low light. A lighter colour text would be better. Of course once you are familiar with which button does what you can ignore the labels. My first test was to record an exploding party popper using the sound mode. I used the Strobeam DL250 MKIII flash and first did a test exposure to determine the flash distance / position and then loaded the popper with flour to get a nice backlit cloud of powder. Once this was done I switched the Triggersmart on and pulled the popper. The unit performed admirably. Firing every time without any errors. I didn't deviate from the instruction manual's initial settings for this. I then moved on to a balloon popping. I filled it with water to make the shot more interesting and to pop the balloon I used a barbecue stick with a needle taped to the end. You could use a pellet gun to shoot the balloon. Again the results were spot on on each occasion. The main flaw was using a flash that didn't have a high flash duration so there's some motion in the shots that would have been frozen with a higher speed flash. Next I tried using the unit as a beam splitter to record a dripping tap. The wine glass was filled with water and positioned under the tap so the drip landed in the centre. Once in place and working I adjusted the sensitivity knob so that the green light was pulsing in tandom with the dripping of the tap and took a test shot. And it's here where the Triggersmart excels. There's a delay in milliseconds from when the drop breaks the beam of the transmitter / receiver to when it hits the surface of the water in the glass. 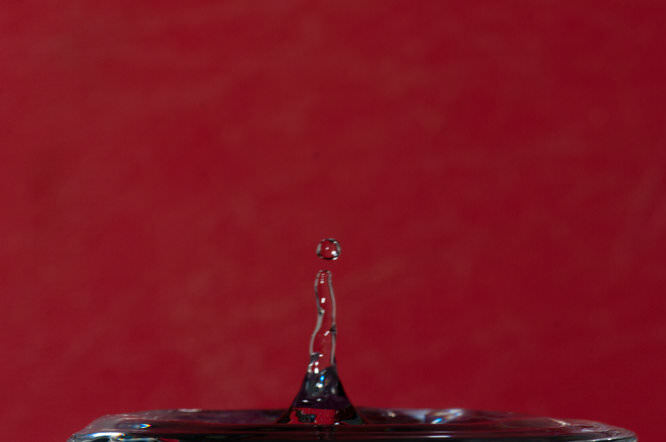 The trigger delay can be finely adjusted so the camera shutter fires when the droplet hits the water or just after as it bounces back into the air. This means you can record the ideal shape of the splashing droplet. With film it would be trial and error but with digital you can take a test shot, adjust the delay and take another until you have the perfect shape. Again I was troubled by flash duration and in this test, bad lighting / set up, but those are things out of control of the Triggersmart which did its job perfectly. 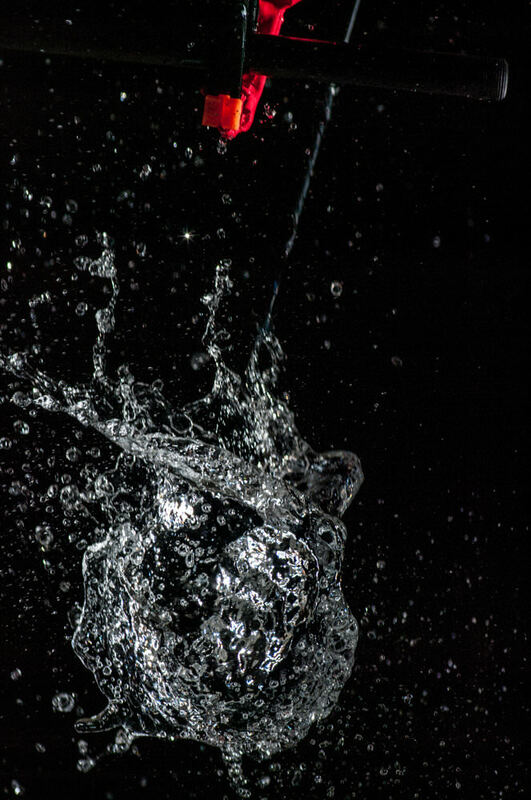 Below is another splash shot - this time dropping a toy into a glass of water. 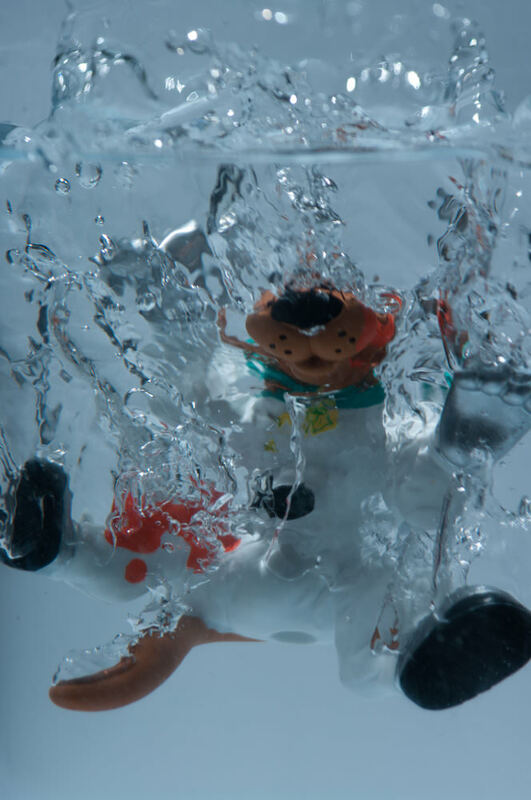 Again I could adjust the trigger delay knob so that I timed the shot with the toy mid way submerged - a millisecond earlier it was hitting the water and a millisecond after floating back to the top with little bubble action. AEO Photo produce the Lightning Strike (light detection unit) that sits on the camera's hot shoe. It's small, convenient and, at $137, much cheaper, but no where near as versatile. Similar to Triggersmart is the Time Machine - a US based company with a wider range of accessories, but each bit adds up to a much more expensive product. 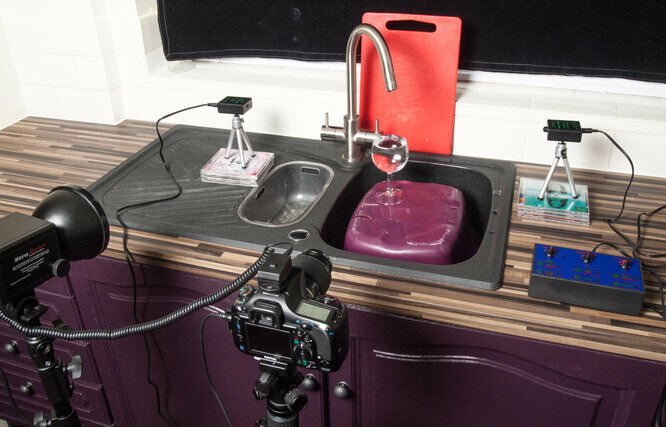 The Time Machine with sensors and camera cable (no tripods) is $500, but they also produce the drip kit which will make your drop photography incredibly precise. I had immense fun playing with motion. Having done this sort of photography before the art is in the timing and here the Triggersmart makes that part of the process foolproof. For £240 it's a fine piece of kit and, tripods aside, well built. You do also need to invest in a flash with a high duration to freeze the motion and make sure you focus well, otherwise the quality of shots will be less impressive. Well worth buying if this sort of photography rocks your boat. 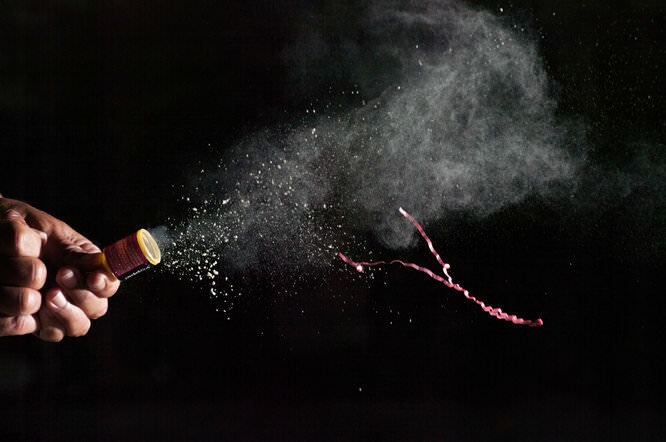 Triggersmart makes the timing of high speed photography foolproof. 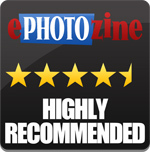 Quote:Well worth buying if this sort of photography rocks your boat. Just got my system up and running after an 8 week delay getting the adapter for my D-700. Seems to work as indicated but not Quantum quality. Even Quantum customer service on this is not up to par. Electronics work well after figuring them out, BUT: The little tripods are a "0" on a 1-10 scale. They barely hold the units. The cables are stiff and and are hard to handle. the Nikon adapter cable is flimsy. I can live with all this, but, if they could just make a few minor upgrades, it could be a great addition to your system. Cost $417.00 plus tax in the U.S. WOULD I BUY IT AGAIN? Yes, because it's where I want to go in my photography. Just got my system up and running after an 8 week delay getting the adapter for my D-700. Seems to work as indicated but not Quantum quality. Even Quantum customer service on this is not up to par. The little tripods are a "0" on a 1-10 scale. They barely hold the units. The cables are stiff and and are hard to handle. the Nikon adapter cable is flimsy. I can live with all this, but, if they could just make a few minor upgrades, it could be a great addition to your system. Cost $417.00 plus tax in the U.S.
WOULD I BUY IT AGAIN? Yes, because it's where I want to go in my photography.